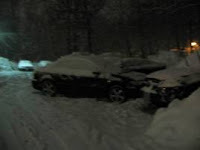 A reader from Germantown, MD tells us that one of her neighbors panicked in their condo parking lot. What else could explain parking in the middle of the lot? S/he blocked in two available spots, and made it very difficult for parked cars on both sides of the street to get out. Snow plows, of course, cannot squeeze by.